Asmodee plans to release six new board game titles this winter (announced as "Q4"), including a game set in the world of Blake & Mortimer, a re-do of Dynasties, a master set of Werewolves of Miller’s Hollow, and more. 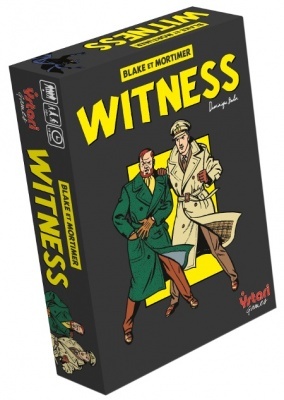 Witness is a cooperative mystery solving game, set in the world of Belgian comic book creator Edgar P. Jacobs’ classic Blake and Mortimer series. Players take the role of heroic characters and try to solve the mysteries with limited information found in their personal booklets. Players must whisper clues to each other over the course of four phases. The game contains hundreds of mysteries of varying difficulty. The game is for four players, ages 13 and up, and plays in 15 minutes. MSRP is $39.99. 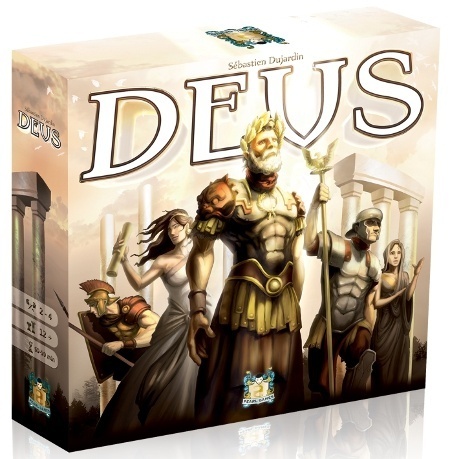 Deus is an empire building game, set in ancient times. Players found cities, harvest natural resources, establish trade routes, conquer barbarian villages and increase their scientific knowledge. Players must also remain in good standing with their deities, by making offerings and building temples. The box contains: 4 small player boards, 7 two-sided continent tiles, 96 building cards, 100 buildings, 7 temples, gold coins, victory point tokens, 80 resources, a first player card and a rulebook. The game is for 2-4 players, ages 12 and up, and plays in 60-90 minutes. MSRP is $59.99. 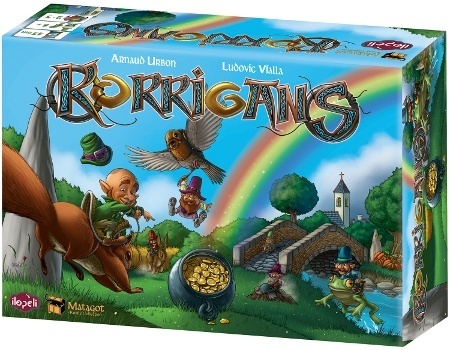 Korrigans is an area movement game that puts players in charge of a tribe of leprechaun-like creatures, who are searching the fields for the elusive pot of gold at the end of the rainbow. Players move their figures around the fields, collecting four-leaf clovers to gain resources to move to other parts of the field. The box contains 16 menhirs and stickers, 10 korrigan figurines, 5 screens, 1 cauldron of gold, 2 elf tokens, 2 goblin tokens, 5 backup companion tokens, 14 rainbow pawns, 1 troll token, 17 additional clover tokens with yellow borders, a first player token, a game board, a fabric bag and a rulebook. The game is for 2-5 players, ages 8 and up, and plays in 30-45 minutes. MSRP is $49.99. 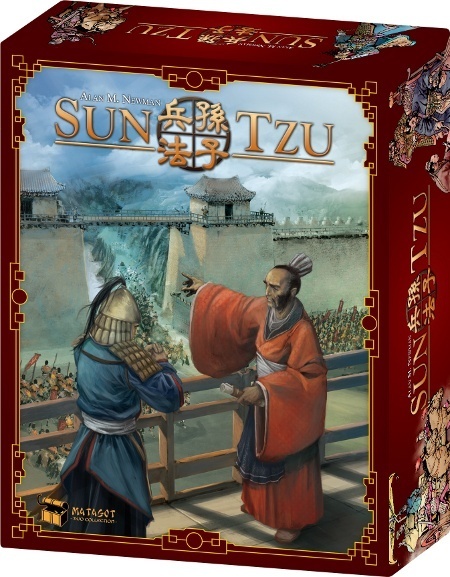 Sun Tzu is a new deluxe edition of Al Newman’s Dynasties game which was originally published by Jolly Roger Games in 2005. The two-player strategy game has opponents take the role of either Sun Tzu or King Shao and attempt to win the war by dominating the most kingdoms of Antic China through cunning, bluffing, and well-timed military strikes. New strategy and event cards add variety to this version of the game. The game is for 2 players, ages 10 and up, and plays in 30 minutes. MSRP is $39.99. 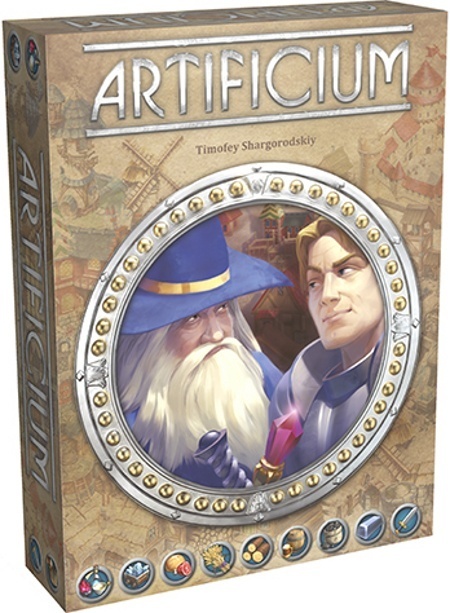 Artificium is a fast-moving worker placement/resource management game that casts players in the role of medieval rulers overseeing their city. Since all goods produced in the city are interconnected, players build efficient production chains (wheat delivered to the mill, which goes to bake bread, which feeds the foundry workers, who produce metal for the smith, who makes swords for the knights, etc.) and try to disrupt their opponents’ chains. The game is for 2-6 players, ages 14 and up, and plays in 20-50 minutes. MSRP is $34.99. 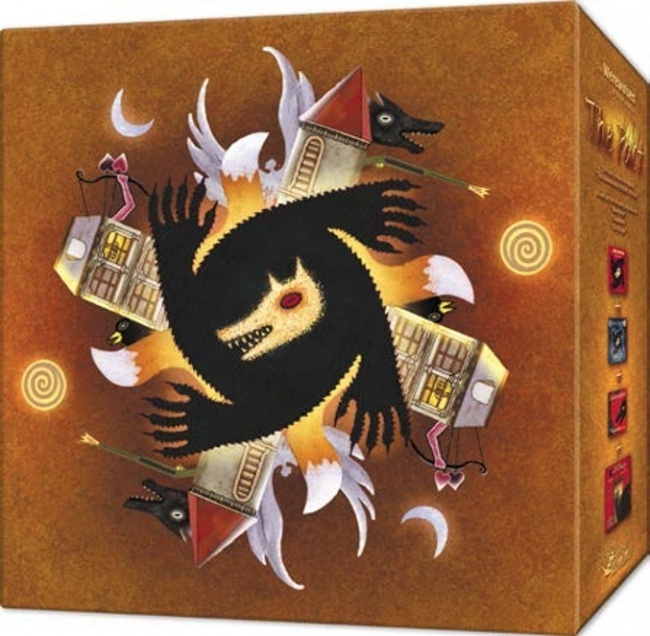 Werewolves: Le Pacte is a master set of the Werewolves of Miller’s Hollow party game, which contains the base game as well as the New Moon, The Village, and Characters expansions (see "'Werewolves--Characters' Expansion for 'Werewolves of Miller's Hollow'"). The box contains 33 different characters, 47 character cards, 29 visible roles, 36 event cards, 14 buildings, 2 bags to store the cards and a detailed rule book. The game is for 9-47 players, ages 10 and up, and plays in 30 minutes. MSRP is $49.99.